Cuba is a unique island nation whose economy has been the subject of contention for decades. It is also a poor country that struggles to provide housing, transportation and other necessities. The Borgen Project outlines five of the main causes of poverty in Cuba. Following Fidel Castro’s assumption of power in 1961, the U.S. imposed an embargo that abruptly deprived Cuban exporters of the recipient of 95 percent of their exports. Since then, the embargo has strictly restricted Cubans’ access to American products, contributing to shortages of everything from food, to electronics and internet access. The legislation of the embargo even includes sanctions against other countries that do business with Cuba. In this way, the embargo significantly limits Cubans’ access to products, partners and the means to climb out of poverty. Like many developing countries across the world, Cuba has historically depended on agriculture as its main industry. Agricultural dependence often limits countries’ abilities to develop infrastructure and establish economic stability. Until the 1990s, the primary economic driver in Cuba was sugar. Because of this historical reliance on a single crop, Cuba has been ill-prepared to deal with changes in the global economy and to diversify beyond its agricultural roots. For more than thirty years, Cuba was allied with the former Soviet Union. This relationship created special trading conditions which benefited the Cuban economy. Cuba traded sugar to the USSR for much-needed goods and economic support; but when the Soviet Union collapsed in 1991, Cuba experienced a 35 percent contraction of its GDP. In a country of only 11 million people, this financial crash was more extreme than the American Great Depression. Cuba has yet to fully recover from this economic blow. Cuba’s troubles with the USSR are part of a larger pattern of centralization. For the majority of the country’s history, Cuba depended on a single trading partner for over 90 percent of its foreign trade. Cuba’s exclusive relationship with first the U.S. and then the USSR caused big problems when these partners suddenly disappeared. Cuba also traditionally focused industrially on sugar production; this centralization further limits Cuba’s ability to find sources of revenue to meet the country’s needs. Cubans enjoy free health care and education, as well as subsidized housing and food rations. These social benefits form a safety net rare to the developing world and even many developed countries; but these social services come at a cost. Spending on social services can limit the amount of money available to the Cuban government and the Cuban people especially in times of economic crisis. The causes of poverty in Cuba are similar to those in the rest of Latin America, but Cuba’s unique position also presents the country with some unique challenges. Still, thanks to Cuba’s vigorous social services, many Cubans can count themselves lucky compared to other impoverished nations. The global financial crisis hurt first world nations as well as developing countries. As one example of this, poverty in Cuba has been affected. The country is doing better than some Latin American countries, but the government is struggling to maintain services such as free healthcare and education. Cuba opened up its economy as a result of the global financial crisis, but it is worse off as a result. Fifteen percent of the population is living in poverty in Cuba. This most recent data is at least 10 years old, though, and more recent numbers are not available. Because of the USSR’s collapse, Cuba was left to fend for itself. This has led to a restructuring of how goods and services are distributed. For example, instead of a universal food supply in the form of food stamps for everyone, Cuba is targeting the most vulnerable. 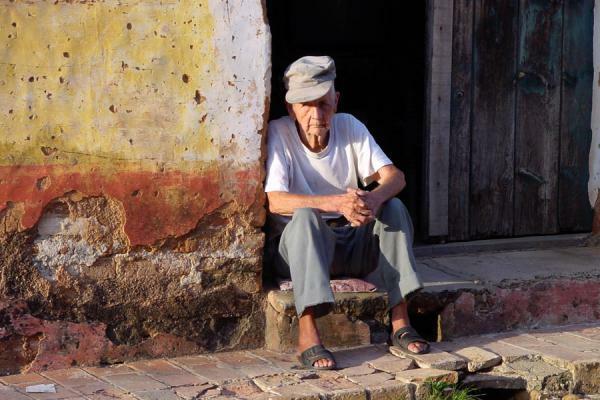 One problem Cuba faces is people living longer, despite the availability of junk food. It is estimated that the population of those over 65 in Cuba will double in the next 20 years. That will swell the number of people seeking healthcare as well as the costs associated as such. About 40 percent of Cubans fall within the “middle class,” which is broadly defined, according to the Brookings Institute, but the average take-home pay for Cubans is $20 per month, or $0.66 per day, based on a 30-day month. Despite this, 90 percent of Cubans own their own homes. Most Cubans can buy and sell property, open small businesses, have cell phones and form cooperatives both on and off farms.” President Raul Castro, who encourages the high ownership rate, is trying to “preserve socialism while introducing new market-based mechanisms,” according to Ted Piccone, a senior fellow at the Brooking Institute who specializes in International Order and Strategy and Latin American Initiatives. Adding to the problem was Batista’s taking millions with him as he fled. This left Cuba without much of the money it needed to rebuild. Despite the country’s economic problems, prices are kept low across the board, with some services still coming free, such as education and healthcare. Those who rent do not pay more than four percent of their income. Cuba’s infant mortality rate is 4.5 per 1,000 live births, placing it among the rates in first-world countries, even ranking above the United States. The wealth indicators here are not necessarily material goods but instead are reflected in the quality of life. This quality does come at a price, though: Cuba’s infrastructure is in very poor shape. Despite Cuba’s economic problems, its medical triumphs show how, despite the embargo by the United States, a country can survive if it looks for help elsewhere, and even become a leader. By investing in people and reaching out, poverty in Cuba and other countries like it can be reduced, and developing nations can make their mark on the world and life for its citizens better as time goes on. After 54 years of severed diplomatic ties, the United States and Cuba, once bitter Cold War enemies, demonstrated their newfound diplomacy by reopening each other’s embassies this past Monday. It is the most concrete example of the diplomatic thaw since President Obama and Cuban President Raul Castro announced last December that US-Cuba relations would be restored. In an interview with MSNBC, President Obama said he believed that Proclamation 3447, the embargo signed by President Kennedy in 1962, has served neither people well, and that it was time to go in a new direction. Although Congress has to pass legislation to formally end the embargo — something that will be very challenging to do — Obama is using his executive power to ease travel and trade restrictions. For the first time in half a century, the United States is able to transparently see the type of living conditions Cubans have been in for the past 50 years. There is poverty in Cuba, but it’s not traditional poverty. When Fidel Castro came to power in 1959, the government became Socialist, and then reformed to become the Communist party of Cuba. During this time, all aspects of Cuban society became nationalized. For the past 50 years, Cubans have enjoyed access to a free healthcare system that has produced a very healthy populace. Today Cuba ranks 61st in the world for life expectancy. Its citizens live roughly to the same age as their American counterparts. This statistic is even more surprising considering that per capita GDP is almost ten times higher in the United States than in Cuba. Economists have coined this phenomenon the ‘Cuban Health Paradox.’ Normally, countries with low per capita GDPs also have low life expectancies. Cubans also have access to free education and the government has tried to make housing and nutrition a priority for its citizens. Although 15 percent of the population still lives in extreme poverty, most of the country is poor. Reports of living conditions are less than ideal. The Cuban peso, which hasn’t been convertible since the revolution, has suffered from inflation. In US dollars, the average Cuban worker earns $17 to $30 a month. Since the Castro family has been in power, Cuba has been relatively isolated. This is has led to the country’s lack of overall wealth. The fall of the Soviet Union worsened matters as the country lost the financial support it used to have from Moscow. The country has persisted; however, this has usually caused Cuba to become more self reliant, therefore poorer. Recently, Cuba has tried to reform its economic system to open up investment to other governments and private companies to accelerate development. The United States reestablishing diplomatic relations with Cuba presents a great opportunity for this to happen. The United States can expand trade markets to one of its closest neighbors, while the influx of capital will raise living standards in Cuba. Poverty in Cuba? Yes. It is difficult to get an unbiased picture of Cuba; some sing its praises, speaking of 100% literacy rates and a country where everyone has easy access to a first-class education, while some vilify it and makes examples of the families who scrape together enough to afford sugar, a repressive political regime and crumbling infrastructure. The reality appears to be a strange mix between the two images, a country that is quite poor but not, as is normally the case, extremely miserable as a result of it. Cuba, a thoroughly non-Western country, also has a thoroughly non-Western brand of poverty. Poverty in Cuba is severe in terms of access to physical commodities, especially in rural areas. Farmers struggle and many women depend on prostitution to make a living. Citizens have few material possessions and lead simpler lives with few luxuries and far more limited political freedom. Yet the nation has enviably high literacy rates and a famously good healthcare system. In terms of levels of abject poverty, Cuba has indeed been through worse. They speak of the ‘Special Period’ in the past where some ate anacondas into extinction and the average Cuban lost ten pounds. Journalists comment that while the young are dissatisfied with Cuba’s current state, older generations remain loyal to Castro ideologies because they recall what life was like before the revolution. In a country with limited resources and a significantly different political and economic ideology, it would be unreasonable to expect Cuba to ever attempt to lift its entire population to the American middle-class ideal. Operating under this mindset, Cuba has been successful in many ways, in managing to provide for its citizens what other countries in the region cannot. This does not, however, mean that Cuba has achieved an ideal. The people of the country are still struggling in a number of ways; food insecurity, frustration and a lack of basic goods plagues the country while the economy struggles. There are no easy answers with Cuba’s charged political history, though the new Castro leadership offers significant hope for opening the country economically, with all the potential benefits such a move would bring. During the recent Community of Latin American and Caribbean States (CELAC) summit, Cuban president Raúl Castro expressed that Latin American and Caribbean leaders all have the ability and resources to end poverty, but merely lack the political willpower. Approximately 26 percent of Cuba’s population is living in poverty, which is the equivalent of 11.2 million people. Over the last five years, Castro has made multiple changes in an attempt to better income gaps. But very few of these changes (such as allowing Cubans to work more than one job at a time) have made a positive impact on the economy and have actually increased poverty in Cuba. Cuba had a thriving health care system not too long ago, but multiple hospitals and emergency clinics have recently been shut down due to scarce medicine and a reduction in government spending. With the growing Cuban population aging 65 years and over, Cuba is on the verge of bankruptcy. The government cost to support health care is skyrocketing since the population of senior citizens is continuing to double. Sánchez explained that electricity costs him up to 40 pesos and his telephone costs him up to 20 pesos per month. With Fidel Castro’s 2005 energy reduction campaign, which forced residents to update old appliances to energy efficient ones, Sánchez now has to pay 65 pesos to the government each month. He states there is very little money left to spend on food. Public education spending has also been reduced, but because much of the younger generation is leaving the country, there has not been a dramatic affect on the population. Without younger and physically capable people, however, Cuba does struggle with housing maintenance and hurricane damage repair. Although the birth rate is relatively low, providing housing for Cuba’s public has been difficult, and this contributes to poverty in Cuba and homelessness. Only about 21,000 houses were constructed in 2013, compared to the 111,400 erected in 2006.